This post is the first of our “Food Supply from Farm to Fork” series. Farm to Fork is a three-part series that will investigate the process in which food travels from growth and production to processing and, finally, to preparing and serving it to our families or guests. 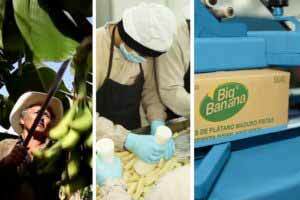 The series of blog posts will be contributed in part by experts along each step of the food supply chain. Whether a chef chooses fresh fruit from his distributor or we open our home freezer to cook a steamed bag of vegetables, the food we eat takes several steps before arriving to the table. From fresh to frozen, the food supply chain is a big business that has an important role in the food products we eat. Food processing companies as well as restaurant chefs or family cooks must assess risk in determining how food is grown and harvested in the farm environment. Farming is the first step of the food supply chain and a crucial cornerstone in serving a high-quality product. As we evaluate farms, whether in the U.S. or abroad, the main factors we look for, in addition to excellent quality of products, are social responsibility and sustainability. Farm owners and managers must make a commitment to deliver the best quality products possible, while holding themselves accountable for how they make it happen, whether in their business decisions or in daily operations. A responsible farmer or farm manager believes in having a positive impact in the community and abiding by ethical business practices. Safe working conditions and fair wages. Farms both within the U.S. and in other countries are often located in rural areas. Agricultural farms impact their surrounding communities positively by giving work to the local residents and promoting economic development to improve the financial outlook of the local community. Ensuring safe working conditions and proper work compensation through fair wages are essential elements of social responsibility for any farm. Ethics and compliance. Laws and regulations are set to protect employees and residents of a community, so farmers need to stay informed and abide by regulatory requirements set by their local, state and federal government. Ethical practices upheld by the farm owners, operators and company executives set the tone for a socially responsible business. Sustainability includes ecological sustainability for the environment as well as economic feasibility for the farm itself to remain in business. Farms must be devoted to providing high-quality food without cutting corners. Ecological sustainability: Farmers need to take good care of the environment and farm surroundings through sustainable agricultural processes. Examples of this may be crop rotation, composting, grazing, irrigation and other practices that make the farms sustainable and environmentally-friendly. Economic feasibility: Farms must have a sustainable business model in order to continue producing their food. Following good economic and business practices allow farms to produce high-quality products through successful operations and productive employees. Farms and the products they grow are the foundation of high-quality food. Farms that practice social responsibility and sustainability set an example for the rest of the food supply chain. Food processing companies and later, chefs or cooks at home, choose farms that abide by these practices to ensure only the best food will reach their restaurant or family table. Our next blog post will cover the processing and distribution part of the food supply chain.